Liverpool has become one of the most popular tourist destinations in England and Europe, bursting with history and with a reputation for friendly and welcoming locals it’s a wonderful place to visit and stay for a night. There are a multitude of cheap hotels, affordable motels and b&bs offering bed and breakfast deals to choose from when staying in the city. Particularly if you are keen to stay in the Albert Dock area and enjoy a waterfront view. With family rooms and late last minute deals on offer it has never been easier to secure a great deal on your overnight accommodation. Popular is also renting an apartment for 1 night or a weekend. Hotels Liverpool Lime Street St.
Liverpool or Manchester to Visit? The Liverpool Reds b&b is basic and budget-friendly while retaining character and class. Situated just a ten-minute bus ride from Anfield Stadium and near the famous botanic gardens, you will not be short of things to do. Elegant House lives up to its name. For a cheap b&b, Elegant House is packed with character and class and has a lovely balance of modern and traditional style. Surrounded by vast green spaces, both Princes Park and Sefton Park are right on the doorstep. Accommodation at The Green House has a unique style in each room. One of the great benefits of The Green House over other hotels, is that it provides access to a kitchen, meaning you can stretch your budget further. The Green House does offer a continental breakfast but if you prefer, just a short walk away you will discover plenty of local pubs and cafes to find a cheap bite to eat. The Beauty Rooms is a b&b which offers affordable budget friendly accommodation while maintaining high standards. Its rooms are decorated in an elegant traditional style. Right on the doorstep, you will find the famous Everton stadium and a short walk or bus ride away you can visit Anfield football stadium too. Seymour Terrace offers basic budget friendly accommodation with a homely feel. Situated right in the heart of Liverpool centre, Seymour Terrace is the ideal place to stay to be able to access all Liverpool has to offer. If you prefer not to opt for the continental breakfast, there are plenty of places to eat nearby. The liner may be outside the cheap range of a budget hotel and more on par with cheaper 3 star hotels, but it is worth it for its superb themed character and luxurious accommodation. 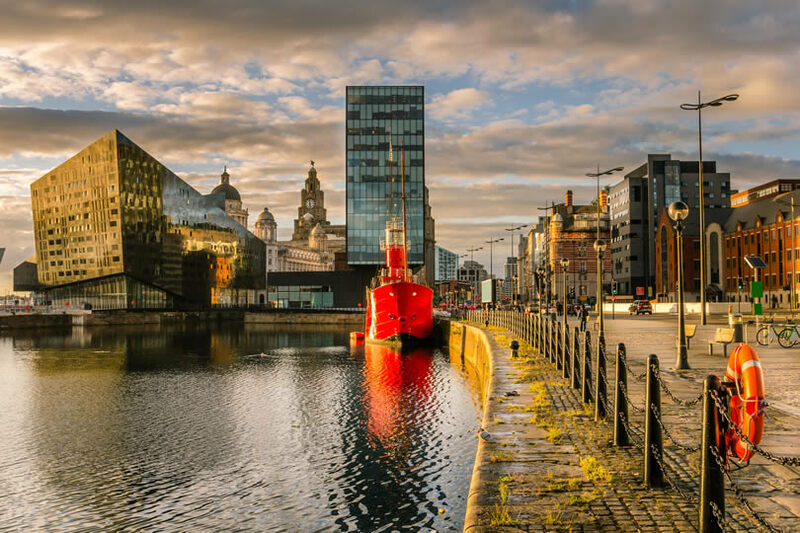 Its central location also makes The Liner an ideal stay if you want to be able to have all Liverpool has to offer right on your doorstep and within walking distance. The Adelphi Hotel is an impressive building with grand features throughout its rooms. You would be surprised to discover that accommodation providing this much elegance and style is reachable on a small budget. What makes The Adelphi even more impressive is its ideal location, which is right next to Liverpool central station. The Holiday Inn commands pride of place on the famous Liverpool Alberts Dock. Accommodation here is basic but clean, affordable, and has everything you need for a comfortable stay. The docks are packed with museums, bars, cafes, shops and restaurants, and there are lots to explore here. The Ibis hotels provide crisp, clean accommodation on a budget. Located right next to the docks, Ibis Liverpool offers plenty to see and do nearby. Venturing further afield, to one of Liverpool’s many cultural sites and places of interest, is easy with a wide variety of public transport links right on your doorstep. Days Inn Liverpool has clean, modern accommodation that won’t break your budget. If you don’t want to eat in its restaurant, you have a wide selection of eateries available on your doorstep. The docks are right outside and are full of a diverse range of bars, cafes and restaurants. The city was one of the most important shipping ports in the world for over two hundred years, connecting central Europe with the America’s. Since this point it has developed commercially and architecturally into one of the UK’s finest destinations thanks to widespread regeneration projects. Hotel deals in the city centre and near Liverpool Albert Dock are perfect for city breaks. Why book a room at a hotel or b&b in Liverpool City Centre ? Liverpool is famous for its warm welcome and lively nightlife. This historic port in the North West of England gets plenty of visitors both passing through and visiting Liverpool in its own right. With extensive redevelopment in the city centre and on the waterfront, there are lots of wonderful places to stay. The city has a rich cultural history and is the birthplace of some of the most popular musicians in the world. 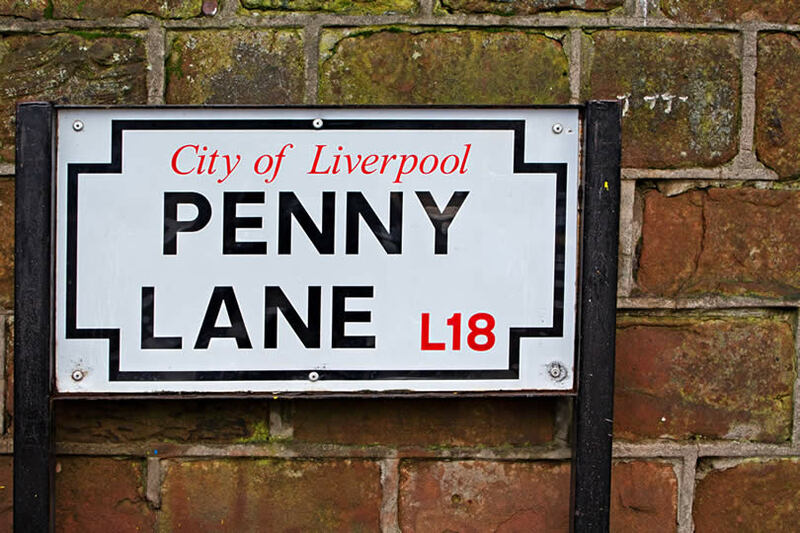 Liverpool’s most famous musical export are the Beatles and the city enjoys nothing more than celebrating its most famous sons. Visitors can stop by the world famous Cavern Club, the birthplace of the band and the site of their first ever gigs. Newly refurbished and featuring a world class collection of memorabilia the club also hosts live tribute bands as well as original acts all in an authentic and exciting setting. The Albert Dock area of the city is not only home to some of the best cheap accommodation to let for a night in the city it is easily one of the most historically interesting areas of Liverpool. With the Merseyside docks Maritime museum, the Tate, the International Slavery museum and the newly completed Museum of Liverpool within five minutes of each other it is one of the most culturally rich enclaves in Europe. The city is also a popular shopping destination thanks to a multi billion pound regeneration project that has improved facilities and attracted some of fashions biggest names to the city centre. In recent years the city has become one of the most popular destinations for city breaks. A luxurious 5-star hotel in Liverpool will be substantially cheaper than equivalent hotels in cities such as Manchester and Newcastle. There is a great choice of hotels in the Ropewalks part of the centre of Liverpool and you are sure to find a bargain if you book in advance and online. Outside of the city centre, there is a large selection of small bed and breakfasts that offer real value for money. If you are heading to Liverpool to see a show or some other popular event, then a b&b is a great way to get cheap accommodation. Self catering in the city is also a better choice than other cities. There are a number of really lovely apartments that will give you a cheap but luxurious accommodation. The Beatles are a huge part of city’s culture, but avoiding hotels connected with them will keep your break on the less expensive side. Due to the city’s increased popularity amougnst tourists a great deal ofaffordable, high quality b&b’s and hotels have been built to accommodate visitors. Heywood house is located just a stones throw away from the docks and offers wonderful views of the waterfront. With pleasant staff and high standards of cleanliness and service the hotel has quickly become one of the most popular places to stay in the Albert dock area. If you prefer to stay for the night closer to the city centre then perhaps the Jury’s Inn would suit you better? A short walk from the main shopping thoroughfare, the Jury’s is one of the most popular cheap hotels in the city. Offering bed and breakfast facilities, family rooms and inexpensive last minute deals the property is popular with those taking weekend breaks to the city. Both Aintree Medical Hospital and Royal University Hospital is within easy reach. Packed with great last minute deals, wonderful hotels, hostels or motels, and great value b&b rooms to stay in, it has never been easier to visit this wonderful Northern city. Other accommodation options include apartments, inns, boats and holiday homes. One of the most popular hotels in Liverpool is The Britannia Adelphi Hotel. This cheaper stay is located in the city centre, nearby Lime Street railway station. The Britannia Adelphi Hotel originally dates back to 1826, but was extensively rebuilt in 1912 to cater for passengers from large cruise liners, many of which were based in Liverpool. Cheap hotels in Liverpool, central located, include the Premier Inn, Travelodge and ibis hotel. Nice properties outside the city include the Park Hotel near Aintree Racecourse and Orell Park Hotel near Aintree University Hospital. Luxurious hotels or boutique hotels can easily be booked in Liverpool as well. Looking for a really cheap option ? A Liverpool hostel can be the perfect option. The city was the home port of all the White Star Line ships, the most famous of which was the Titanic. The Sefton suite at the hotel is an exact replica of the Smoking Lounge aboard the Titanic. Anfield Stadium is the home of world famous Liverpool FC football club (see hotels nearby). 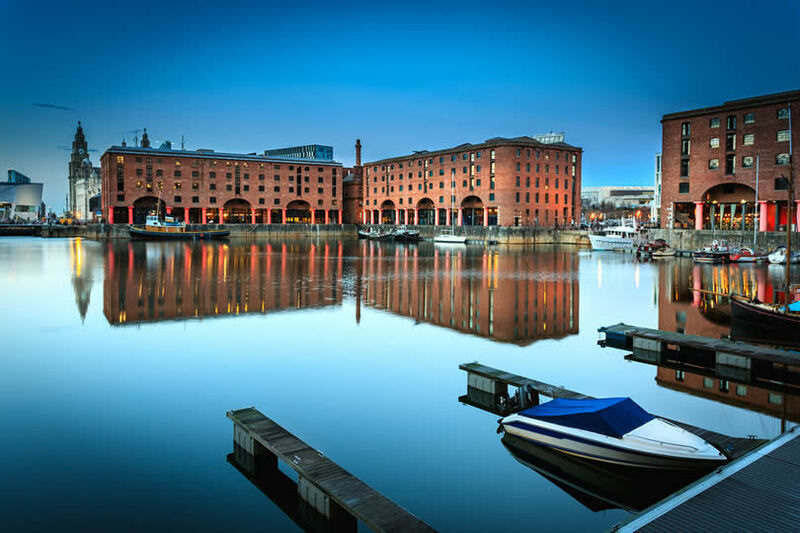 Check hotel availability and compare room rates for accommodation in the city centre close to Albert Dock. While staying overnight here you are able to visit the famous Tate Modern and The Beatles Story, or the Cavern Quarter, with the famous Cavern Club. A lodging facility with great room rates is very popular 3 star Jurys Inn. This very popular establishment is situated at Kings Waterfront, adjacent to the Albert Dock and directly opposite the new ACC Arena and Convention Centre. Lime Street Railway Station, which is connected with numerous destinations all over the country, is the city’s mainline station. It’s operated by Network Rail (overground) and Merseyrail (underground). Long distance train connections include Milton Keynes Central, Newcastle-upon-Tyne train station, York Train Station and Nottingham Central Station. The city centre is located in north-western part of England. The city lies in the metropolitain county of Merseyside on the eastern banks of the river Mersey. Another major city in the region is Manchester, where plenty of cheap deals for overnight Manchester accommodation with breakfast is on offer as well. Visitors and tourist flying to the city will mostly arrive at nearby Liverpool John Lennon Airport (LPL), which is the main airport. Also Manchester International Airport hotels can easily be reached in 45-60 minutes. Whilst visiting the city you can enjoy the busy night life, local tourist attractions which include the Albert Dock, museums and cathedrals. Find your place to stay : the city has much to offer. It was once the home of the Beatles and maritime Britain. 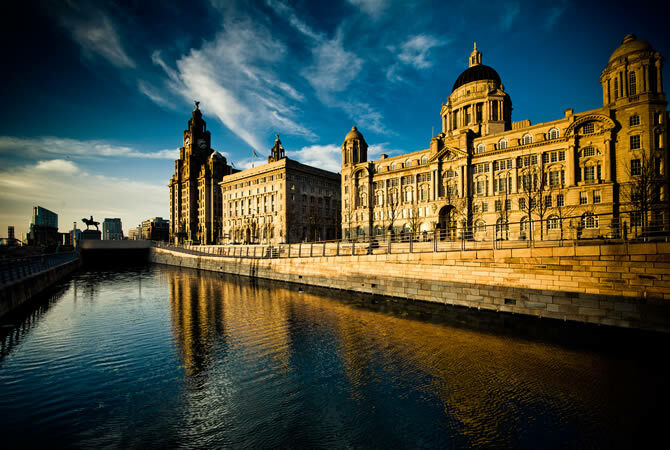 Liver Building, Cunard Building, and the Port of Liverpool building are known as The Three Graces, located at the vibrant waterfront.